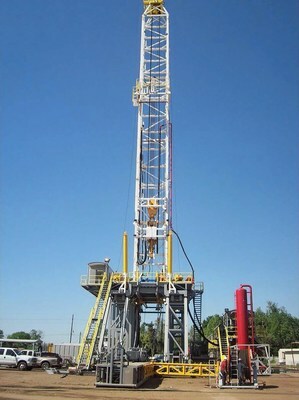 ODESSA, TX, Oct. 10, 2018 /PRNewswire/ - Kruse Energy Auctioneers, a Ritchie Bros. solution focusing on energy equipment-related auctions, recently sold a Loadcraft 2000HP SCR drilling rig at its event in Odessa, TX for US$5.5 million, making it the most expensive drilling rig the company has ever sold. The high bidder for the rig was Scandrill Inc., an onshore drilling contractor operating in the Permian Basin, Louisiana, and Texas. Scandrill Inc. currently has 15 rigs in operation. "This is the most expensive single item we've ever purchased by auction; and we've been in business for 41 years," said Paul M. Mosvold, President and COO of Scandrill. "It definitely makes your palms sweaty when you're making bids that high." "The 2008 built DSI/Loadcraft rig was an opportunistic purchase—we haven't decided exactly where and who it will be drilling for, but likely it will be put to work for our Texas operation," continued Mr. Mosvold. "The rig has 'good bones' and will eventually be upgraded to become our 3rd Super Spec Shales Rig or as we call our rigs, Norseman II series." Close to 1,300 equipment items were sold in the Kruse Energy auction in Odessa on September 27, 2018, including coiled tubing, frac and cement equipment, well service rigs, pumps, drill pipe, truck, trailers and more. Other sales highlights included a 2013 MAD T/A cement pump trailer and an acid frac pump trailer that sold for US$225,000 each; two FORUM 2250 hydraulic pipe handlers that sold for US$135,000 each; and a 2006 Peterbilt 378 tri-axle truck tractor sold for US$50,000. "On top of the record-breaking drilling rig, we saw strong pricing for most of the equipment in our September Kruse auction, including a large dispersal of 221 items for B.J. Services," said Jeff Jeter, President of U.S. Sales, Ritchie Bros. "There's some real positive momentum in the market right now for energy equipment, as witnessed in the Kruse event and other recent Ritchie Bros. auctions. We are already accepting consignments for our next Kruse auction in Oklahoma City on October 31 – November 1 and Odessa, TX on December 5 – 6." For more information about upcoming Kruse Energy events, visit KruseEnergy.com.